Above is a couple of pictures of a Yellow Jack (Caranx bartholomaei). 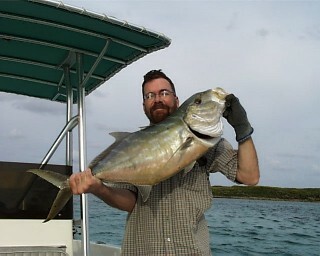 Yellow jacks reach sizes of up to about 20 pounds. They are an wide ranging Atlantic Species, including the Gulf of Mexico. 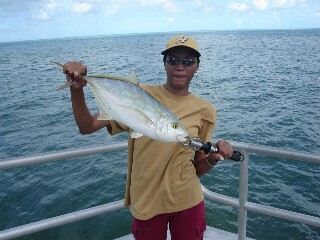 These pictures are typical of yellow jacks in shape and fin arrangement but the coloration is not the norm. Yellow Jacks and at least 3 other species of jacks have been known to exibit this color pattern in March. They are typically somewhat yellowish when large and more green-grey/silvery when smaller. It is speculated that this strange coloration, most often exhibited in the Bahamas, could have something to do with spawning but that is unconfirmed.